If you head down to the IBEW Local 24 Union Hall Auditorium on W. Patapsco Avenue in Baltimore on the first Tuesday of any month, you’ll encounter a meeting of an energetic group of young union members from the Metro Baltimore-Washington, D.C. area. 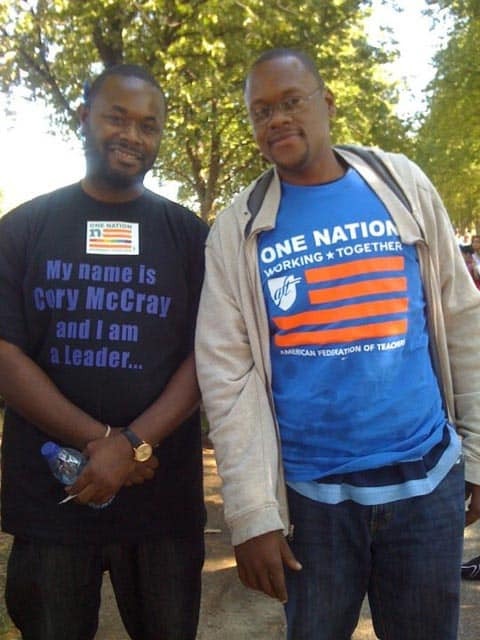 The Young Trade Unionists (YTU) was founded in November 2009 by Cory McCray, a graduate of both the Baltimore City Public School System and the five-year apprenticeship program of the International Brotherhood of Electrical Workers. Participants in the YTU include young workers from the IBEW, UFCW, teachers’ unions, building trades, public employees’ and other sectors. On the heels of the massive rally and march across the Brooklyn Bridge last week — and coinciding with the arrival of Occupy Wall Street (#OWS) marchers in Washington, D.C., today and Wednesday’s “day of action” in DC — I spoke with McCray about the ways in which the #OWS movement and young workers today might deepen their bonds. McCray participated in this past weekend’s 28th Biennial Convention of the Maryland State and District of Columbia AFL-CIO, where membership passed a resolution for its members to treat occupy sites in DC and Baltimore as they would a formal picket line. MR: How have young workers in Baltimore and all of Maryland been perceiving, and talking about, the Occupy Wall Street movement? Cory McCray: Amongst young workers, it’s something that’s definitely supported due to the fact that in Baltimore, as young workers, we’ve seen multipliers for pension programs go up, we’ve seen the cost of low wages and manufacturing jobs going overseas and numerous other actions that have been taken, not only amongst workers in general but young workers that have been affected the most. I attended the State Federation conference this weekend, AFL-CIO, and one of the actions that the Young Trade Unionists proposed from the Baltimore side was to show solidarity at a meeting on December 6 at McKeldin Square. What do you think are some of the possibilities for labor and #OWS to work together? CM: I think they go hand in hand because the labor movement has always fought against the foreclosures, the high cost of education, the workplace violations, the large corporations. . . So many of the things that #OWS are bringing to attention and putting to the forefront are always things that labor has taken action on. But right now it’s such a visible tone because it’s very strategic and placed all across the country. Right now, the labor movement has a great possibility of having something come to fruition with the #OWS movement. But I think that this is probably the beginning, that’s what it looks like. And it’s ready to come to something big. And when we do these types of things, we always are going to need partners. It’s definitely not only going to be labor. It’s also going to have to be the communities, the churches, LGBT, the minority factor. I think that it takes everyone as a whole to lift up the workers. Have you noticed any difference in the way between younger workers and older workers have been thinking and talking about the #OWS movement? CM: I think that the older workers are definitely showing support. When I was talking to a lot of the older workers, they said, “I can see myself in the people in #OWS — during the 1970s, 1960s, in the marches.” And they’re just trying to show support in any type of way, letting them know they’re not trying to take the issue and get in front of it. You know how sometimes something can be coming and something can be bursting and then you’ll find that people will jump on the bandwagon. And then you look and they’re controlling the issue. Well, they’re kinda letting #OWS control itself and just show support. On Saturday, the Maryland DC AFL-CIO approved a resolution calling on its members to treat #OWS encampments in DC and Baltimore as they would a formal picket line. Do you know the history of this resolution or what might result from the resolution? WHEREAS, Unemployment is the highest it has been since the Great Depression, and people are staying unemployed longer now than in the Great Depression, an unacceptable number of Maryland and District of Columbia homes are underwater, and foreclosures continue to increase. WHEREAS, while the rest of us struggle, surviving on less and less, the big banks profit more and more. They are getting rich by taking all we have. We have paid with our lives and livelihoods so that a select few can be the richest in the world. WHEREAS, all around the country, people are standing up and demanding accountability from banks, corporations, and from our governments, we recognize that we are not alone, and that together we have power. BE IT FINALLY RESOLVED that Maryland State and District of Columbia AFL-CIO will contribute $3000 both the OCCUPY BALTIMORE and the OCCUPY DC actions.